If you are an NLP Trainer with recognised qualifications at the levels of NLP Practitioner, NLP Master Practitioner and NLP Trainer then we may be able to accredit your NLP courses. Are you running or thinking of running NLP Practitioner, NLP Master Practitioner or Coaching training courses? Would you like to have your courses and students accredited by the NLPEA? We can make that happen for you. 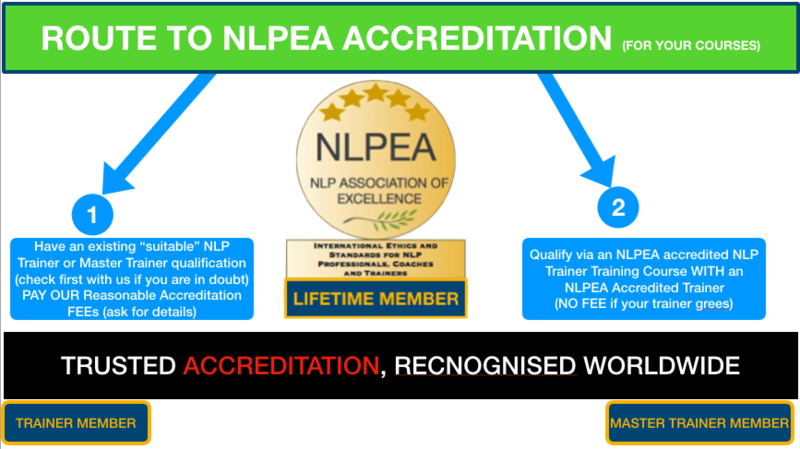 Additional Benefit – NLPEA Trainer members will be able to offer their students the unique opportunity for qualification as an Accredited NLPEA Transformation Coach (in addition to the other standard NLP and Coaching qualifications). Unlike other membership bodies and associations who charge annual fees, our accreditation is gained by paying a one off membership fee (and predetermined approval fee unless you gain membership one of our Master Trainer Member courses). Once you are a member of the NLPEA we will take you through the process of accrediting your courses. This will involve you providing us with details of the type of courses that you intend to run, the qualifications that you will provide, your location. You will also need to submit details of the length of the course and the way that you will assess your students. Once we have confirmed that your courses meet our requirements then you may use our marketing materials and logo to promote your courses and to use on your certificates. You will be able to offer your own students free lifetime membership of the NLPEA upon qualification. Please feel free to get in touch with any questions that you may have or to start the accreditation process. See our standards for NLP Practitioner and Master Practitioner courses. THE WORLD NEEDS MORE NLP AND COACHING TRAINING PROVIDERS. This may be your easiest and most affordable route to market (and we include some amazing benefits in our package. JOIN US TODAY.